Paper 3 3/8" x 2 1/8"
Four-color process printed on both sides of uncoated 100lb White Smooth stock. 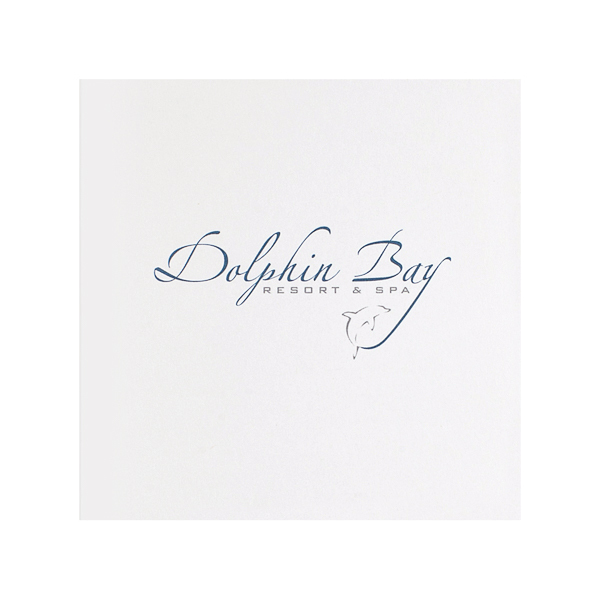 A dolphin leaps out of the tail on the "Y" in Dolphin Bay Resort & Spa's cover design. It resurfaces on the right outer panel, along with a monogram version of the logo. A resort map spans the center and right panels, with a key at left. Both the fold-down pocket and the area behind it are printed with the same part of the map to make sure guests always know where to go. Four-color process printed on both sides of 80lb C2S Silk Text stock (currently unavailable). Coated with Aqueous Satin. Golden Isle Hotel welcomes guests with room keys in an unusual tri-panel design. 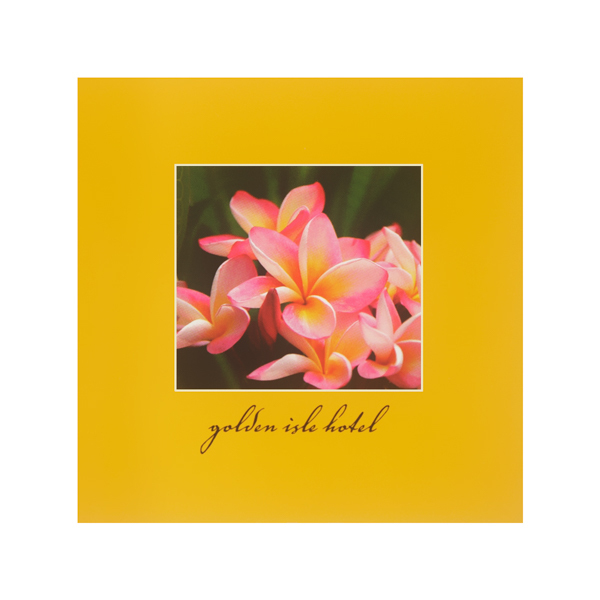 Its cover features a photo of pink flowers in a gold border, painting a picture of tranquility and beauty. The interior includes helpful resources, like a welcome letter, a privilege pass, and a map of the resort's dining areas and amenities. Subtle photos of palm trees help put guests in a relaxed, tropical state of mind. Four-color process printed on both sides of uncoated 80lb White Smooth stock. K2 card slit on pocket. 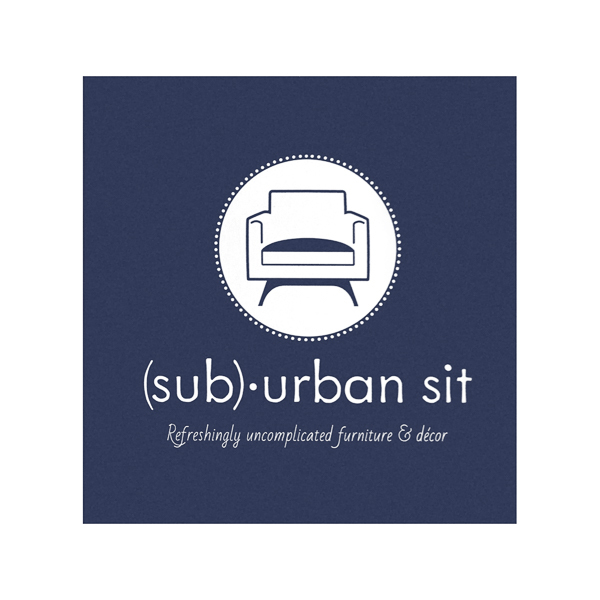 Blue and gray panels perfectly match the contemporary, casual style of Suburban Sit furniture and décor. The logo and slogan are on the cover, while the interior includes a thank-you note and invitation for shoppers to return. The right outer panel houses the Ohio retailer's product list. Contact information is located on the back panel under a smaller version of the logo. Four-color process printed on both sides of 80lb White Silk stock. Coated with Aqueous Matte. K2 key card on center pocket. 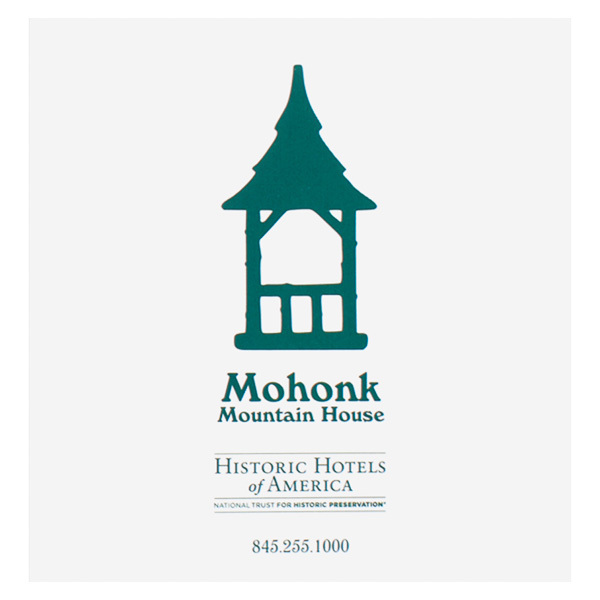 The palatial Mohonk Mountain House resort starts with a green design on a white cover, which includes its phone number, logo, and historic status. On the tri-panel interior, guests can read about the available activities or navigate Mohonk with a grounds map. A photo on the back invites guests to unwind with a local craft beer in The Carriage Lounge, the Mohonk's premier dining area. Triple the panels mean triple the protection for 2 1/8" x 3 3/8" hotel key cards, gift cards, or other small print media. A single unglued pocket on the center panel houses a horizontal slit, which in turn holds the card in place. The center panel is the least mobile and is covered by the other two panels when closed, giving your card maximum protection against spills or jostling. Customize all three panels individually or with a continuous design for a unified viewing experience. Dimension Closed: 3 5/8" x 3 3/4"
Dimension Open: 10 13/15" x 3 3/4"
Acceptable Insert Sizes: 3 3/8" x 2 1/8"